I started diving in 1983. In 1989 I bought a Nikonos 5 and started to take pictures, later a Nikon f 90X, and early 2008 a Nikon D200. 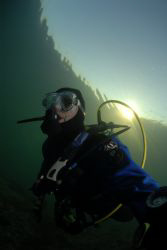 Living In Switzerland, most of my diving is done in lakes and I have a lot of pleasure trying to show the beauty of freshwaters.